If you’ve never had a chilblain, you may wonder what the fuss is about – and why some people quake in their sheepskin boots when the weather gets chilly. 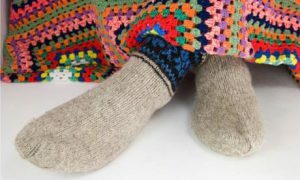 Chilblains are painful, burning or itchy red and blue patches that appear on extremities such as the fingers, feet, ears or nose. One in 10 people suffer from them when these parts of the body are suddenly warmed up after being exposed to the cold (winter is peak season for chilblains). However, a well-behaved one should go on its own within three weeks. Chilblains are caused by poor circulation in response to the cold. The tiny blood vessels under the skin narrow in low temperatures. When the skin warms up again they become leaky and fluid gets into the surrounding tissue, causing inflammation. To prevent them you should warm your skin gently after being out in the cold: don’t wrap yourself around the radiator when you get home. When outside keep your limbs and face warm with thermals, layers of loose clothing and a hat. Don’t rest your feet on a hot water bottle in bed but wear socks instead. If these preventative measures don’t work and your chilblains are painful, purple and itchy beyond belief, you should visit a Podiatrist. Most people never see a podiatrist for chilblains, as they tend to go on their own if you don’t scratch or apply direct heat to them. If your chilblain seems infected (warm, red and sore), then you should get it looked at. If you have diabetes and get chilblains you should also see your doctor as they are more likely to get infected. If you have them repeatedly out of chilblain season you should be checked for underlying connective tissue disorders.